The naturally occurring hydrothermal system at Valles is subdivided into the Redondo, Sulphur Springs, and Jemez Springs based on the distribution of springs and fumaroles, past geothermal exploration projects, and scientific drilling programs. Surface discharges at Redondo and Sulphur Springs are fed by upwelling fluids from chemically distinct, isolated reservoirs beneath the caldera floor. Waters from these reservoirs also feed the Jemez Springs System outside the caldera walls to the southwest, reaching the springs primarily by structurally controlled lateral outflow and by more minor flow through Paleozoic strata. The locations of these geothermal areas and of the Fenton Hill HDR Project are shown in Figure 1. An HDR reservoir is a permeable region created by pressure-stimulation and hydraulic fracturing of a previously impermeable body of hot, crystalline rock. An HDR reservoir is confined, and is enclosed within a stress cage that reflects the earth’s elastic response to pressure-dilation of the reservoir. The outer boundary of this confined reservoir is defined by the furthest extent of flow-accessible joints established during hydraulic fracturing and creation of the reservoir, and may be extended by additional pressure-stimulation. An HDR reservoir is an engineered system in which the primary operating parameters can be designed or controlled. In the case of Fenton Hill, these parameters include the production temperature (by selecting the drilling depth), the size of the reservoir (by the amount of fluid injected), and the operating pressure (and consequently, the flow rate) of the system (also by the amount and rate of fluid injection, and by operating the injection and production wells under pressure)." cannot be used as a page name in this wiki. Figure 1. Map showing the locations of the Redondo, Sulphur Springs, and Jemez Springs geothermal areas and of the Fenton Hill HDR Project of the Valles Caldera. Modified from Goff and Janik (2002) Figure 2. The Valles Caldera is located in the Jemez Mountains volcanic field of north-central New Mexico. Valles is the type example of a resurgent caldera system, and is host to a long-lived <300°C geothermal system. Documentation of hot spring occurrences of the Jemez Plateau dates back to before 1913, and includes descriptions of discharges at Jemez Springs and Sulphur Springs. From 1968 – 1970, the U.S. Geological Survey (USGS) conducted several early studies describing the caldera geology, stratigraphy, and structure. Bailey et al. originally described the intracaldera volcanic stratigraphy in 1969 as (from youngest to oldest) the Banco Bonito, El Cajete, and Battleship Rock Members of the Valles Rhyolite based on surface mapping of the caldera. The stratigraphy of the caldera and of the Fenton Hill Hot Dry Rock (HDR) Project area have since been refined based on surface geologic mapping and lithologies from exploratory drill holes and CSDP scientific wells. Numerous geochronology studies have also contributed to the interpreted stratigraphy and eruptive history of the caldera. Ages of spring deposits, eruptive units, and core samples of vein minerals and altered host rocks have been determined by 14C, K-Ar, Ar-Ar, Rb-Sr, U series,  thermoluminescence, and Electron Spin Resonance (ESR) dating methods. The U.S. government purchased the caldera in 2000 and designated it the Valles Caldera National Preserve, with the intention of protecting its unique geology and scenic beauty while promoting scientific investigations, including the preparation of detailed geologic maps. An HDR reservoir is an engineered system in which the primary operating parameters can be designed or controlled. In the case of Fenton Hill, these parameters include the production temperature (by selecting the drilling depth), the size of the reservoir (by the amount of fluid injected), and the operating pressure (and consequently, the flow rate) of the system (also by the amount and rate of fluid injection, and by operating the injection and production wells under pressure). Ownership of Baca Location No. 1, which encompassed Valle Grande, Valle San Antonio, Valle Santa Rosa, and Redondo Creek, was awarded to the family of Francisco Tomás Baca in 1860 as a part of an exchange that settled a dispute over the land rights to what was then known as the Town of Las Vegas . Ongoing disagreements over ownership, inheritance, and outside interests in the increasingly partitioned land claim led to numerous commercial, legal, and occasionally bloody disputes during the late nineteenth century. Ownership of various claims within the land package changed hands several times during this period. The caldera has been the site of numerous logging operations since gold and silver were discovered south of the property in 1889, which spurred demand for timber needed for major mines and boomtowns that subsequently sprang up in the area. Logging activities were concluded in 2001 following purchase of the Baca Location No. 1 by the U.S. government in 2000. The caldera has also been used as grazing land for horses, cattle, and sheep by various parties throughout its ownership history, with operations continuing through 2002. A complete history of ownership and development of the Valles Caldera can be found in Merlan and Anschuetz (2007). Geothermal exploration at Valles began in 1959 when Union Oil Company (UOC) drilled a series of wells into a portion of the Redondo Peak Resurgent Dome as a part of a development program within what was known as the Baca Project Area (now referred to as the Redondo Geothermal Area). Drilling results defined a high temperature reservoir beneath the resurgent dome; however, the overall volume of the system was ultimately deemed to be too small for commercial development and the project was abandoned in 1983. Drilling activities were continued as a part of the Continental Scientific Drilling Program (CSDP) between 1984 and 1988, during which time three core holes (VC-1, VC-2A, and VC-2B) were drilled to better understand the stratigraphy, structure, hydrothermal alteration, and subsurface architecture of the Valles Caldera. An additional core hole, VC-3, was drilled in 2004 as part of the GLAD5 project to investigate major climatic changes and glacial/interglacial cycles recorded in lacustrine sediments below Valle Grande. While the findings of this shallow core hole are significant with respect to paleoclimate research, they pose little relevance to the exploration for geothermal resources. 1913: Hot springs documented at Valles Caldera. 1860: Francisco Tomás Baca is given ownership of Baca Location No. 1. 1889: Gold and silver discovered south of Valles Caldera. 1959: Unocal purchases lease for the Baca Geothermal Field. The company drills several wells into the Redondo Peak Resurgent Dome. 1968-1970: USGS Investigations at Valles Caldera. 1972: The Fenton Hill site west of Valles Caldera is selected to test the HDR concept based on temperature gradient drilling results. 1974: Construction begins on the world’s first HDR geothermal reservoir (Fenton Hill Phase I Reservoir). 1979: Construction begins on the second Phase II HDR geothermal reservoir at Fenton Hill. 1983: Unocal abandons the Valles Caldera exploration project. 1984-1988: The VC-1, VC-2A, and VC-2B core holes are drilled within Valles Caldera under the Continental Scientific Drilling Program. 1986: Initial Closed-Loop Flow Testing of the Phase II reservoir begins. 1992-1993: Long-Term Flow Testing of the Phase II Reservoir at Fenton Hill begins. 1995: Fenton Hill HDR Project is concluded following the final Long-Term Flow Test of the engineered Phase II reservoir. 2000: U.S. government designates Valles Caldera as a National Preserve. 2004: The VC-3 core hole is drilled at Valles Caldera under the GLAD5 project. The U.S. government purchased the caldera in 2000 and designated it the Valles Caldera National Preserve. The preserve was established in order to protect the caldera’s unique geology and scenic beauty, and to promote scientific investigations into the nature of resurgent calderas, of which Valles Caldera is the type example. Several studies have since been conducted that have yielded considerable information regarding the geologic history of the caldera, the formation and drainage of post-eruption intracaldera paleolakes, and the paleoclimate of the region; these studies have resulted in the preparation of detailed geologic maps. These investigations are ongoing, and will continue to refine scientific understanding of the processes governing caldera systems. The HDR Project at Fenton Hill was concluded in 1995 with completion of the extended Long-Term Flow Test (LTFT) of the Phase II reservoir. No further plans for ongoing testing at the site have been announced. 46.8 +/- 4.3°C/km between 640 and 720 m depth. These variations in temperature gradient were interpreted to result from channeled groundwater flow in the lower sections of the hole. Despite these results, the overall heat flow was found to be highest on the western margin of the caldera, and the Fenton Hill site was chosen to test the HDR concept. These drilling activities are the closest approximation to exploration work conducted at the site prior to development of the HDR reservoirs. Subsequent drilling and flow testing of the engineered reservoirs at Fenton Hill are detailed in the Well Field Description section of this review." cannot be used as a page name in this wiki. These variations in temperature gradient were interpreted to result from channeled groundwater flow in the lower sections of the hole. Despite these results, the overall heat flow was found to be highest on the western margin of the caldera, and the Fenton Hill site was chosen to test the HDR concept. These drilling activities are the closest approximation to exploration work conducted at the site prior to development of the HDR reservoirs. Subsequent drilling and flow testing of the engineered reservoirs at Fenton Hill are detailed in the Well Field Description section of this review. "Construction of the world’s first HDR geothermal reservoir began at Fenton Hill in 1974.'"`UNIQ--ref-00000059-QINU`"' The injection (hole EE-1) and production (hole GT-2B) wells were drilled into the target formation and were then connected by hydraulic pressure stimulation of joints and fractures within the rock mass. Two shallow reservoirs were created during the early stages of the project, and are collectively referred to as the Phase I reservoirs. The results of the flow testing and heat-extraction experiments and of the chemical analysis of the geothermal fluids from the Phase I reservoirs are reported by Dash et al. (1983)'"`UNIQ--ref-0000005A-QINU`"' and Grigsby et al. (1983),'"`UNIQ--ref-0000005B-QINU`"' and are summarized in numerous reports by other authors.'"`UNIQ--ref-0000005C-QINU`"''"`UNIQ--ref-0000005D-QINU`"''"`UNIQ--ref-0000005E-QINU`"''"`UNIQ--ref-0000005F-QINU`"''"`UNIQ--ref-00000060-QINU`"' Geochemical results of these studies are discussed briefly in the final section of this review. Flow testing of the Phase I reservoirs was conducted between 1978 and 1980 to evaluate the effectiveness of hydraulic pressure stimulation and test the viability of extracting a thermal resource from hot rocks in an engineered reservoir lacking in-situ geothermal fluids.'"`UNIQ--ref-00000061-QINU`"' A shallow reservoir was originally created in jointed biotite granodiorite at a depth of about 2,500 m with an initial rock temperature of 185°C. Heat-extraction and flow testing experiments were conducted in this reservoir from January 27 to April 13, 1978. 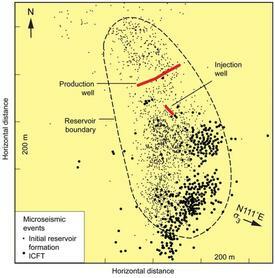 A second, larger reservoir was created in March 1979 after recementing the fracture-to-wellbore connections in well EE-1 at 2,930 m depth and refracturing 200 m deeper in the first of a series of pressure stimulation experiments that would become known as the Massive Hydraulic Fracturing (MHF) Tests (refracturing was accomplished during experiments 203 and 195).'"`UNIQ--ref-00000062-QINU`"' The average initial rock temperature of the final Phase I reservoir was 197°C.'"`UNIQ--ref-00000063-QINU`"' Flow and heat-extraction tests were run in the second reservoir from October 23 to November 16, 1979. The Phase I reservoirs grew continuously during Run Segments 2 through 5 (January 1978 to December 1980). Although the reservoir is relatively small in volume, 3-5 MW(t) of heat were produced for more than 9 months with only an 8°C decline in production temperature.'"`UNIQ--ref-00000064-QINU`"' The heat-transfer area and fracture volume within the reservoir grew from 8000 to 50,000 m^2 and from 11 to 266 m^3, respectively. Growth of the Phase I reservoirs was caused both by pressurization and hydraulic fracturing and by the effects of heat-extraction and thermal-contraction. The rate of diffusional water loss to the margins of the Phase I reservoir was 0.4 L/s after 5 months of flow testing. The final volume of the Phase I reservoir was determined to be 10 million cubic meters, defined by an envelope containing the majority of microseismic events measured during flow testing (i.e., the seismic volume). Construction of a second, deeper Phase II reservoir began in 1979 with the drilling of the EE-2 and EE-3 wells to depths of approximately 3,500 m in order to extend the HDR technology to the temperatures and rates of heat production required to support a commercial power plant.'"`UNIQ--ref-00000065-QINU`"' Initial attempts to connect the two wells by hydraulic pressure-stimulation in December 1982 during the 5.792 x 10^5 liter-MHF Experiment 2025 were unsuccessful. Efforts to produce a viable Phase II reservoir continued with the MHF Experiment 2032, conducted in December 1983 in jointed granitic host rocks with an average temperature of 235°C.'"`UNIQ--ref-00000066-QINU`"' '"`UNIQ--ref-00000067-QINU`"''"`UNIQ--ref-00000068-QINU`"''"`UNIQ--ref-00000069-QINU`"' Although some 21,600 m^3 of water were injected into EE-2 at maximum flow rates of 100 L/s and downhole pressure of 83 MPa, the resulting fracture pattern again failed to connect the two wells. Geophone emplacement holes PC-1 and PC-2 were drilled at Fenton Hill by Maness Drilling Company of Farmington, NM for Los Alamos National Laboratory in 1984. These wells were drilled to facilitate microseismic monitoring of ongoing MHF experiments attempting to produce a viable geothermal reservoir.'"`UNIQ--ref-0000006A-QINU`"' PC-1 was completed to a final depth of 663.9 m in March 1984, and encountered maximum temperatures of 84°C. PC-2 was drilled to a total depth of 558 m in August 1984 following MHF experiment 2042, and encountered maximum temperatures of 54°C. Lithology and temperature logs from these wells are discussed in Shevenell et al. (1988). A report published in 1988 integrated stratigraphic, temperature gradient, hydrogeochemical, hydrologic, and geologic data from these and other wells in order to construct a comprehensive hydrologic and temperature gradient model of the hydrothermal outflow plume issuing from the western margin of the Valles Caldera.'"`UNIQ--ref-0000006B-QINU`"' Details of this model are discussed in the final section of this review. A third attempt to fracture the reservoir from May 15-19, 1984 during MHF Experiment 2042, this time by injecting 7.57 million liters of water at approximately 20 L/s and 41.37 MPa pressure into the 3,472-3,587 m interval of the EE-3 well, produced similar results.'"`UNIQ--ref-0000006C-QINU`"' A geophone sonde was also placed in the EE-1 wellbore at this time at a depth of 2,865 m in order to detect and locate microearthquakes triggered during hydraulic fracturing of the reservoir.'"`UNIQ--ref-0000006D-QINU`"' '"`UNIQ--ref-0000006E-QINU`"' Additional sensors were also placed at 3,444 m depth in the EE-2 wellbore, at 750 m depth in GT-1, at 2,438 m depth in GT-2, and at 655 m depth in PC-1.'"`UNIQ--ref-0000006F-QINU`"' Nine surface seismic stations were also operated during the MHF Test to aid in environmental monitoring.'"`UNIQ--ref-00000070-QINU`"' These difficulties prompted the redirection of well EE-3 in 1985, which was sidetracked at a depth of 2,900 m and re-drilled through the fracture zone associated with EE-2. This re-drilled well is known as EE-3A, and it successfully established hydraulic communication between the two wells. Based on a 2-D procedure contributed by Lutz (1986), Fehler et al. (1987) developed a three-point statistical method for identifying fault or joint planes within three dimensions in what may otherwise appear to be an amorphous microearthquake location set.'"`UNIQ--ref-00000071-QINU`"' The method was applied to the microseismic data collected during the MHF Test, and was able to resolve five statistically significant planes along which most of the microearthquakes occurred. Correlation of these planes where they intersect fluid injection zones (as determined from temperature logs) and/or zones of weakness (as determined from caliper log breakout zones) confirmed that the planes identified coincide with the major fluid paths during hydraulic injection.'"`UNIQ--ref-00000072-QINU`"' Microseismic data were also used to determine the seismic volume of the reservoir, defined by an envelope-shaped region containing the majority of the measured microseismic events. The initial seismic volume of the Phase II reservoir created during the MHF Test was 130 million m^3, produced at a joint extension pressure of 38 MPa. Additionally, the total seismic volume of the Phase II reservoir is significantly larger than the flow-connected portion of the reservoir accessible to the production well, which appears to be only about 16 million m^3.'"`UNIQ--ref-00000073-QINU`"' The areal extent of the seismic volume of the Phase II reservoir is shown in Figure 2. Improved planning and placement of multiple production wells would greatly increase the flow-connected reservoir volume and the heat transfer area accessible for thermal power production. The Phase II reservoir was flow tested in mid-1986 during the Initial Closed-Loop Flow Test (ICFT), and again from 1992 to 1993 during the Long-Term Flow Test (LTFT).'"`UNIQ--ref-00000074-QINU`"''"`UNIQ--ref-00000075-QINU`"' During the ICFT, cold water was injected into well EE-3A at pressures up to 32 MPa, and hot water was successfully recovered from EE-2 at temperatures as hot as 192°C, with production of up to 10 MWt.'"`UNIQ--ref-00000076-QINU`"' Produced waters were cooled to 20°C using a water-to-air heat exchanger prior to re-injection. The ICFT also showed that the flow impedance of the Phase II reservoir was concentrated at the production wellbore, with less than 10% of the overall flow impedance located in the body of the reservoir itself. Low impedance was also encountered at the injection well, accounting for less than 1% of the overall impedance. These effects relate to pressure-propping of flowing manifolding joints within the reservoir by a mean pressure of 27.5 MPa above hydrostatic (compared to 10 MPa least principal earth stress) and to thermal dilation near the injection well. The volume of the Phase II reservoir was also significantly extended to the south and east over the course of the 30-day ICFT. A series of brief flow tests were conducted on the Phase II reservoir between 1989 and 1990 leading up to the LTFT.'"`UNIQ--ref-00000077-QINU`"' The rate of water loss steadily declined following an initial transient period of increased water storage within the Phase II reservoir. After 9 out of a total of 17 months of pressurization at 15 MPa above hydrostatic pressure, the rate of water loss from the Phase II reservoir approached a constant value of about 0.13 L/s, suggesting a transition to diffusional water loss from the spherical reservoir volume. The LTFT of the Phase II reservoir was conducted in two phases for 16 weeks from April to July in 1992 and again for 8 weeks concluding in May of 1993.'"`UNIQ--ref-00000079-QINU`"' During the first phase of the LTFT, the Phase II reservoir was operated at approximately a 6.8 L/s injection rate and 10 MPa backpressure. Between the two phases of the LTFT, a 6 week Interim Flow Test (IFT) was conducted at backpressures of 10 MPa and lower injection rates of 4.3 L/s (22 MPa)--in addition to two months of testing in November and December of 1992 where the reservoir was operated under injection rates of 7.1 L/s and backpressures of 12 MPa. The second phase of the LTFT used injection rates of 7.3 L/s and backpressures of 15 MPa. Injection pressures were only varied during the IFT--all other flow tests were run using a 27 MPa injection pressure. The temperature of the injected water used during each test was approximately 18°C. During the first phase of the LTFT, waters were produced from well EE-2 at flow rates of 5.7 L/s and temperatures of 183°C. Under the reduced injection pressures of the IFT, production flow rates and temperatures were 3.9 L/s and 165°C, respectively. Further increasing the backpressure to 15 MPa resulted in a return to production flow rates of 5.7 L/s at temperatures of 183°C. During the second phase of the LTFT (the highest backpressure test), flow rates were 5.3 L/s at temperatures of 177°C. An additional closed-loop flow test was conducted in the Phase II reservoir from May 10 to July 14, 1995 to investigate and compare changes in heat transfer and reservoir volume to those measured during previous circulation tests.'"`UNIQ--ref-0000007A-QINU`"' Furthermore, chemical tracer tests were performed in an effort to improve understanding of the spatial characteristics of reservoir conduits, especially those that constitute major fluid flow paths. The study found that over time, the longer residence-time paths account for progressively more of the total flow, and flow paths through the reservoir volume become more diffuse. Modeling of the Phase II reservoir using the GEOCRACK discrete-element reservoir simulator suggested that additional flow paths open up to previously less accessible paths as the inlet region is progressively cooled.'"`UNIQ--ref-0000007B-QINU`"''"`UNIQ--ref-0000007C-QINU`"''"`UNIQ--ref-0000007D-QINU`"''"`UNIQ--ref-0000007E-QINU`"' The model suggests that by varying the pressures at the injection and production wells, up to a four-fold increase in the accessible reservoir volume could be achieved at Fenton Hill, with only a small decrease in flow rate of 1 L/s.'"`UNIQ--ref-0000007F-QINU`"''"`UNIQ--ref-00000080-QINU`"'" cannot be used as a page name in this wiki. Construction of the world’s first HDR geothermal reservoir began at Fenton Hill in 1974. The injection (hole EE-1) and production (hole GT-2B) wells were drilled into the target formation and were then connected by hydraulic pressure stimulation of joints and fractures within the rock mass. Two shallow reservoirs were created during the early stages of the project, and are collectively referred to as the Phase I reservoirs. The results of the flow testing and heat-extraction experiments and of the chemical analysis of the geothermal fluids from the Phase I reservoirs are reported by Dash et al. (1983) and Grigsby et al. (1983), and are summarized in numerous reports by other authors. Geochemical results of these studies are discussed briefly in the final section of this review. Flow testing of the Phase I reservoirs was conducted between 1978 and 1980 to evaluate the effectiveness of hydraulic pressure stimulation and test the viability of extracting a thermal resource from hot rocks in an engineered reservoir lacking in-situ geothermal fluids. A shallow reservoir was originally created in jointed biotite granodiorite at a depth of about 2,500 m with an initial rock temperature of 185°C. Heat-extraction and flow testing experiments were conducted in this reservoir from January 27 to April 13, 1978. A second, larger reservoir was created in March 1979 after recementing the fracture-to-wellbore connections in well EE-1 at 2,930 m depth and refracturing 200 m deeper in the first of a series of pressure stimulation experiments that would become known as the Massive Hydraulic Fracturing (MHF) Tests (refracturing was accomplished during experiments 203 and 195). The average initial rock temperature of the final Phase I reservoir was 197°C. Flow and heat-extraction tests were run in the second reservoir from October 23 to November 16, 1979. The Phase I reservoirs grew continuously during Run Segments 2 through 5 (January 1978 to December 1980). Although the reservoir is relatively small in volume, 3-5 MW(t) of heat were produced for more than 9 months with only an 8°C decline in production temperature. The heat-transfer area and fracture volume within the reservoir grew from 8000 to 50,000 m^2 and from 11 to 266 m^3, respectively. Growth of the Phase I reservoirs was caused both by pressurization and hydraulic fracturing and by the effects of heat-extraction and thermal-contraction. The rate of diffusional water loss to the margins of the Phase I reservoir was 0.4 L/s after 5 months of flow testing. The final volume of the Phase I reservoir was determined to be 10 million cubic meters, defined by an envelope containing the majority of microseismic events measured during flow testing (i.e., the seismic volume). Construction of a second, deeper Phase II reservoir began in 1979 with the drilling of the EE-2 and EE-3 wells to depths of approximately 3,500 m in order to extend the HDR technology to the temperatures and rates of heat production required to support a commercial power plant. Initial attempts to connect the two wells by hydraulic pressure-stimulation in December 1982 during the 5.792 x 10^5 liter-MHF Experiment 2025 were unsuccessful. Efforts to produce a viable Phase II reservoir continued with the MHF Experiment 2032, conducted in December 1983 in jointed granitic host rocks with an average temperature of 235°C. Although some 21,600 m^3 of water were injected into EE-2 at maximum flow rates of 100 L/s and downhole pressure of 83 MPa, the resulting fracture pattern again failed to connect the two wells. Geophone emplacement holes PC-1 and PC-2 were drilled at Fenton Hill by Maness Drilling Company of Farmington, NM for Los Alamos National Laboratory in 1984. These wells were drilled to facilitate microseismic monitoring of ongoing MHF experiments attempting to produce a viable geothermal reservoir. PC-1 was completed to a final depth of 663.9 m in March 1984, and encountered maximum temperatures of 84°C. PC-2 was drilled to a total depth of 558 m in August 1984 following MHF experiment 2042, and encountered maximum temperatures of 54°C. Lithology and temperature logs from these wells are discussed in Shevenell et al. (1988). A report published in 1988 integrated stratigraphic, temperature gradient, hydrogeochemical, hydrologic, and geologic data from these and other wells in order to construct a comprehensive hydrologic and temperature gradient model of the hydrothermal outflow plume issuing from the western margin of the Valles Caldera. Details of this model are discussed in the final section of this review. A third attempt to fracture the reservoir from May 15-19, 1984 during MHF Experiment 2042, this time by injecting 7.57 million liters of water at approximately 20 L/s and 41.37 MPa pressure into the 3,472-3,587 m interval of the EE-3 well, produced similar results. A geophone sonde was also placed in the EE-1 wellbore at this time at a depth of 2,865 m in order to detect and locate microearthquakes triggered during hydraulic fracturing of the reservoir. Additional sensors were also placed at 3,444 m depth in the EE-2 wellbore, at 750 m depth in GT-1, at 2,438 m depth in GT-2, and at 655 m depth in PC-1. Nine surface seismic stations were also operated during the MHF Test to aid in environmental monitoring. These difficulties prompted the redirection of well EE-3 in 1985, which was sidetracked at a depth of 2,900 m and re-drilled through the fracture zone associated with EE-2. This re-drilled well is known as EE-3A, and it successfully established hydraulic communication between the two wells. Based on a 2-D procedure contributed by Lutz (1986), Fehler et al. (1987) developed a three-point statistical method for identifying fault or joint planes within three dimensions in what may otherwise appear to be an amorphous microearthquake location set. The method was applied to the microseismic data collected during the MHF Test, and was able to resolve five statistically significant planes along which most of the microearthquakes occurred. Correlation of these planes where they intersect fluid injection zones (as determined from temperature logs) and/or zones of weakness (as determined from caliper log breakout zones) confirmed that the planes identified coincide with the major fluid paths during hydraulic injection. Microseismic data were also used to determine the seismic volume of the reservoir, defined by an envelope-shaped region containing the majority of the measured microseismic events. The initial seismic volume of the Phase II reservoir created during the MHF Test was 130 million m^3, produced at a joint extension pressure of 38 MPa. Additionally, the total seismic volume of the Phase II reservoir is significantly larger than the flow-connected portion of the reservoir accessible to the production well, which appears to be only about 16 million m^3. The areal extent of the seismic volume of the Phase II reservoir is shown in Figure 2. Improved planning and placement of multiple production wells would greatly increase the flow-connected reservoir volume and the heat transfer area accessible for thermal power production. The Phase II reservoir was flow tested in mid-1986 during the Initial Closed-Loop Flow Test (ICFT), and again from 1992 to 1993 during the Long-Term Flow Test (LTFT). During the ICFT, cold water was injected into well EE-3A at pressures up to 32 MPa, and hot water was successfully recovered from EE-2 at temperatures as hot as 192°C, with production of up to 10 MWt. Produced waters were cooled to 20°C using a water-to-air heat exchanger prior to re-injection. The ICFT also showed that the flow impedance of the Phase II reservoir was concentrated at the production wellbore, with less than 10% of the overall flow impedance located in the body of the reservoir itself. Low impedance was also encountered at the injection well, accounting for less than 1% of the overall impedance. These effects relate to pressure-propping of flowing manifolding joints within the reservoir by a mean pressure of 27.5 MPa above hydrostatic (compared to 10 MPa least principal earth stress) and to thermal dilation near the injection well. The volume of the Phase II reservoir was also significantly extended to the south and east over the course of the 30-day ICFT. A series of brief flow tests were conducted on the Phase II reservoir between 1989 and 1990 leading up to the LTFT. The rate of water loss steadily declined following an initial transient period of increased water storage within the Phase II reservoir. After 9 out of a total of 17 months of pressurization at 15 MPa above hydrostatic pressure, the rate of water loss from the Phase II reservoir approached a constant value of about 0.13 L/s, suggesting a transition to diffusional water loss from the spherical reservoir volume. Figure 2. Distribution of seismic events that define the seismic volume of the Phase II reservoir at Fenton Hill. Injection (EE-3A) and production (EE-2) wells, and the direction of least principle earth stress (sigma 3) are also shown. Figure 2 from Brown (2009). The LTFT of the Phase II reservoir was conducted in two phases for 16 weeks from April to July in 1992 and again for 8 weeks concluding in May of 1993. During the first phase of the LTFT, the Phase II reservoir was operated at approximately a 6.8 L/s injection rate and 10 MPa backpressure. Between the two phases of the LTFT, a 6 week Interim Flow Test (IFT) was conducted at backpressures of 10 MPa and lower injection rates of 4.3 L/s (22 MPa)--in addition to two months of testing in November and December of 1992 where the reservoir was operated under injection rates of 7.1 L/s and backpressures of 12 MPa. The second phase of the LTFT used injection rates of 7.3 L/s and backpressures of 15 MPa. Injection pressures were only varied during the IFT--all other flow tests were run using a 27 MPa injection pressure. The temperature of the injected water used during each test was approximately 18°C. During the first phase of the LTFT, waters were produced from well EE-2 at flow rates of 5.7 L/s and temperatures of 183°C. Under the reduced injection pressures of the IFT, production flow rates and temperatures were 3.9 L/s and 165°C, respectively. Further increasing the backpressure to 15 MPa resulted in a return to production flow rates of 5.7 L/s at temperatures of 183°C. During the second phase of the LTFT (the highest backpressure test), flow rates were 5.3 L/s at temperatures of 177°C. An additional closed-loop flow test was conducted in the Phase II reservoir from May 10 to July 14, 1995 to investigate and compare changes in heat transfer and reservoir volume to those measured during previous circulation tests. Furthermore, chemical tracer tests were performed in an effort to improve understanding of the spatial characteristics of reservoir conduits, especially those that constitute major fluid flow paths. The study found that over time, the longer residence-time paths account for progressively more of the total flow, and flow paths through the reservoir volume become more diffuse. Modeling of the Phase II reservoir using the GEOCRACK discrete-element reservoir simulator suggested that additional flow paths open up to previously less accessible paths as the inlet region is progressively cooled. The model suggests that by varying the pressures at the injection and production wells, up to a four-fold increase in the accessible reservoir volume could be achieved at Fenton Hill, with only a small decrease in flow rate of 1 L/s. Schematic diagram of the Fenton Hill geothermal project, operated by Los Alamos National Laboratory, New Mexico, USA. The system works on the principal of a closed loop for pumping water into a well situated 2,590 meters under the Jemez Plateau, New Mexico, that is surrounded by hot granitic rock at a temperature of 185°C. The water absorbs heat and is brought back to the surface under sufficient pressure to prevent it boiling. Part of the heat from the well was used to boil Freon 114 to produce a vapour that drove a small turbine which yielded 60 KW of electrical power. Image and caption provided by the Science Photo Library. The natural geothermal reservoirs within the Valles Caldera have not been developed for commercial electricity production, although the field is capable of producing about 20 MWe. However, the adjacent Fenton Hill Hot Dry Rock Project to the west has been the subject of some of the first reservoir engineering, fluid circulation/recovery, and power generation experiments with EGS applications. Production and injection wells must be drilled to depths where temperatures are likely to be suitable for electricity generation, between 200 and 300°C. Even in areas with favorable geothermal gradients, these temperatures are only encountered at great depths where the minimum in-situ principle earth stress is likely to be 35 to 100 MPa, typically between 3 to 5 km depth. The reservoir rock must be fractured, and the fractures held open so that the permeability remains sufficiently high to promote low resistance to fluid flow. The induced fracture pattern must be oriented such that it promotes hydraulic communication between the injection and production wells. In practice, the injection and production wells at Fenton Hill were drilled prior to fracturing hot crystalline reservoir rocks, resulting in poor connectivity between the wells and low recovery of the heated fluid. The injection well (EE-3A) was ultimately re-drilled to intersect the fracture network produced in the Phase II reservoir. Perhaps the most crucial lesson gained from the Fenton Hill HDR Project is that the stimulated volume of hot rock should be fractured from the initial borehole prior to the drilling of production boreholes near the long-axis boundaries on either side of the ellipsoidal seismic reservoir volume. To first drill two boreholes and then try to connect them by hydraulic fracturing, as was initially attempted at Fenton Hill, is nearly impossible. The use of two production wells would (in theory) double the productivity of the Phase II reservoir, and would allow for a sustained thermal power production level of about 20 MW over a period of at least 15 years. Additionally, a second production well would allow for maintenance of even higher reservoir pressures, which would result in greater dilation of the flowing joints and reduce the body impedance while also constraining additional reservoir growth. The most critical issue relating to HDR technology development is reservoir productivity, which directly relates to outlet impedance as fluid flow converges at the production well. Impedance can be reduced by operating the production well at elevated pressure, which dilates flow outlets in the jointed rock body in the vicinity of the wellbore. Large areas of the rock must be adequately hydrated to result in heat transfer. Excessive water loss to the country rock around the fractured reservoir must be avoided, as all water must be provided from sources outside the system. Water loss at Fenton Hill was minimal as the engineered reservoirs appear to by hydrologically isolated from major faults and nearby natural hydrothermal reservoirs. If significant volumes of water are lost and accumulate downhole, damaging earthquakes could result from the lubrication and slippage of existing faults. Induced earthquakes were not a major problem over the course of the Fenton Hill HDR Project as water loss and the magnitudes of seismic events at the site during testing were relatively low. Microearthquake monitoring indicated that the majority of the seismic events measured during the MHF Test fell between extrapolated Richter scale body wave magnitudes of -3 and 0. Seismicity was similarly low during the ICFT, during which the largest event registered about 0.4 on the extrapolated Richter scale. Potential geochemical problems can result from dissolution of reservoir rocks and may cause scaling of surface equipment or corrosion of piping. Figure 3. Location map of the Valles Caldera, north-central New Mexico. The caldera lies at the intersection of the Jemez Lineament and the Rio Grande Rift. Modified from Goff and Janik (2002). The Valles Caldera is a Quaternary volcanic collapse feature with a diameter of 22 km. It was formed by the latest catastrophic volcanic eruption in the Jemez Mountains volcanic field of north-central New Mexico at 1.25 Ma. The caldera itself is situated at the intersection of the Jemez Lineament and the western edge of the Rio Grande Rift. The Rio Grande Rift is a major extensional feature consisting of a series of north-trending asymmetric sedimentary basins separated by transfer and scissor fault zones that stretches over 1,000 km from Leadville, CO to Chihuahua, Mexico. Rifting was preceded by northeast-southwest compression that created foreland basins and uplifted fault blocks during the Late Cretaceous Laramide Orogeny. This period was followed by a shift to backarc extensional tectonics during the Cenozoic, with formation of the Rio Grande Rift beginning at about 30 Ma and lasting until approximately 18 Ma. Extension also initiated a minor period of primarily basaltic volcanic activity that produced large shield volcanoes, cinder cones, fissures, flood-basalts, and tuffaceous ash layers. Rifting continued during a second period of tectonic activity lasting from approximately 10 Ma to 3 Ma, accompanied by a major period of volcanism beginning approximately 5 Ma. Igneous rocks of the Rio Grande Rift formed during this time contrast sharply with those of the Jemez volcanic field. 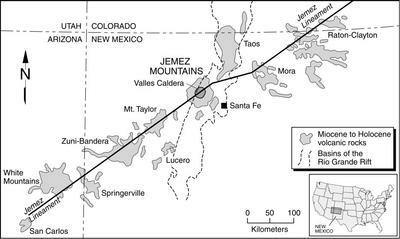 A series of basaltic through rhyolitic eruptions between 16.5 Ma and 40 ka form a northeast-trending chain of volcanic centers that define the Jemez Mountains volcanic field, which lies along the Jemez Lineament. The Jemez Lineament is thought to be a major zone of weakness in the lithosphere and is not defined by a single through-going fault of fracture. Figure 3 shows the locations of the Valles Caldera, Rio Grande Rift, and Jemez Lineament in north-central New Mexico. An estimated volume of 400-475 km3 of high-silica rhyolitic ignimbrite was produced by each of the caldera-forming eruptions of the Jemez Mountains Volcanic Field, and was deposited as non-welded to densely welded tuffaceous units (the Bandelier Tuff) of varying thickness that covered the surrounding topography. Ignimbrites deposited during the explosive formation of the Valles and Toledo Calderas are exposed at Valles and throughout the surrounding region, consisting of the upper Tshirege (Qbt) and lower Otowi (Qbo; c.a. 1.6 Ma) members of the Bandelier Tuff, commonly referred to as the upper and lower Bandelier Tuffs, respectively. The most recent 40Ar/39Ar date on the upper Bandelier Tuff is 1.256+0.010 Ma and defines the timing of eruption of the Valles Caldera. Volcanics exposed throughout the Jemez Mountains Volcanic Field are largely unaltered, although both fresh and hydrothermally altered tuffs are present in the caldera center and topographic rim. Drill holes and gravity investigations within the caldera indicate that the caldera depression is filled by as much as 2,000 m of densely welded ignimbrite and that the caldera is asymmetric, being considerably deeper in the east than in the west. The La Cueva member (Qblc), recently redefined as the basal member of the Bandelier Tuff, is a lithic-rich, pumiceous, rhyolitic ignimbrite that is traceable for nearly 20 km in San Diego Canyon to the southwest of the caldera. The Bandelier Tuff is underlain by porphyritic dacite and andesite domes and lava flows (Ttu, Tpa) and Tertiary basin-fill sediments and volcaniclastic deposits of the Santa Fe Group (Ts, Tsf, Tscu) to the east. These rocks thin beneath the western side of the caldera, and are underlain by Permian strata (Pu), Mississippian-Pennsylvanian sedimentary rocks (MIPu, including the Madera Formation limestone), and Precambrian crystalline basement rocks (pC) of the Colorado Plateau. Shortly after the eruption of the upper Bandelier Tuff, erosion of the caldera walls formed talus slopes, alluvial fans, and debris flow deposits that thin towards the center of the crater. During this time, an intracaldera lake formed, depositing laminated to bedded lacustrine sediments (Qvs), the floor of the caldera began to rise, forming the Redondo Peak Resurgent Dome, and relatively small volumes of rhyolite lava and tuff erupted from the caldera center. These steeply- to moderately-dipping rock units overlie the upper Bandelier Tuff, and are exposed along the middle and lower flanks of the resurgent dome. Co-resurgence eruptive members of the Valles Rhyolite include the porphyritic Deer Canyon Lava (Qdc) and lithic tuff (Qdct) and the overlying Redondo Creek Lava (Qrc), all of which are interbedded with lacustrine and debris flow deposits (Qdf). The most recent 40Ar/39Ar dates range from 1.25+0.02 to 1.26+0.02 for the Deer Canyon lavas and 1.21+0.02 to 1.26+0.04 Ma for the Redondo Creek lava, limiting the duration of co-resurgence volcanism to approximately 27 ka after formation of the caldera. The Valles Rhyolite also includes a series of post-resurgence moat rhyolites erupted between 1.23 Ma and about 40 ka  that overly the Redondo Creek lavas. These units form a series of rhyolitic flow and dome complexes that are distributed in a counterclockwise arc beginning with the oldest dome on the eastern side of the caldera and the youngest dome located southeast of Redondo Peak. From oldest to youngest, these eruptive units are the Cerro del Medio (Qvdm), Cerros del Abrigo (Qvda), Cerro Santa Rosa (Qvsr), Cerro San Luis (Qvsl), Cerro Seco (Qvse), San Antonio Mountain (Qvsa), and South Mountain (Qvsm) members of the Valles Rhyolite. Recent geologic mapping of the caldera has revealed that deposition of post-resurgence moat rhyolites was accompanied by at least three periods of lacustrine sedimentation (Ql) at roughly 0.8 Ma, 0.5 Ma, and 55 ka. The East Fork Member of the Valles Rhyolite represents the most recent series of volcanic units erupted between about 60-40 ka, and includes the Battleship Rock Ignimbrite (Qvbr), El Cajete Pyroclastic Beds (Qvec), and the Banco Bonito Flow (Qvb). These units were recognized during initial geologic mapping of the caldera, and are concentrated in the southwestern moat zone adjacent to Redondo Peak and South Mountain. Rocks of the East Fork Member are texturally distinct and are readily distinguishable in the field: the Battleship Rock Ignimbrite consists of a sequence of pyroclastic deposits that form a prominent cliff where the Jemez River forks to the east; the El Cajete Pyroclastic Beds are a series of mantle-bedded air fall deposits made up of pumice lapilli and blocks; and the Banco Bonito Flow is a porphyritic obsidian flow deposit that fills the southwestern caldera moat. A mix of Gneiss, Schist, Granodiorite, Granite, and Metavolcanic rocks below about 3050 m depth. Figure 4 shows a simplified stratigraphic column that includes the rock types of the Precambrian sequence intersected during drilling at Fenton Hill. Figure 4. Simplified stratigraphic column of the Precambrian sequence at Fenton Hill. Also shown are the depth of the injection and production wellbores of the Phase I (GT-2 and EE-1) and Phase II (EE-2 and EE-3) reservoirs, and the approximate depth of the two reservoirs tested. The temperature scale (right axis) is from a temperature log measured in wellbore EE-2. From Grigsby et al. (1989). 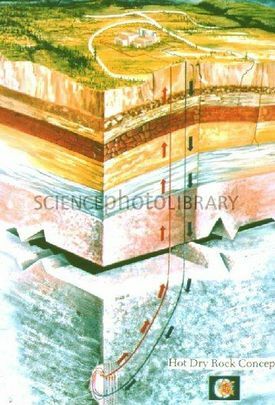 There are no major structures associated with the Fenton Hill engineered geothermal system as the reservoir was produced by pressure stimulation and opening of joints in Precambrian basement rocks. The following description pertains to structures associated with the Valles Caldera that control upflow and outflow in the naturally occurring hydrothermal system. The eruption of approximately 440 cubic kilometers  of upper Bandelier Tuff and concurrent collapse of the Valles Caldera resulted in extensive faulting and down-to-the-north displacement along a ring-fracture zone of the south caldera wall. The position of the ring-fracture zone is inferred from the arcuate distribution of rhyolitic domes of the Valles Rhyolites Formation, which are arranged in a counterclockwise distribution with the oldest dome (Cerro del Medio) located on the eastern side of the caldera and the youngest dome (South Mountain) located just southeast of the Redondo Peak Resurgent Dome. Gravity and drill hole data indicate that maximum displacement on Precambrian basement is on the order of several kilometers and increases beneath Valle Grande toward the eastern sector of the caldera. Uplift of the Redondo Peak resurgent dome following the collapse of the caldera represents an additional structural style. The caldera-filling ignimbrite that makes up Redondo Peak was uplifted at least 1000 m, resulting in intense faulting that formed the northeast-trending medial (or keystone) Redondo Creek Graben and several associated cross faults. Resurgence also resulted in the formation of several cross faults along the margins of Redondo Peak, segmenting the adjacent caldera-filling volcaniclastic and sedimentary units into distinct fault blocks. The orientation of the graben and the elongation of the resurgent dome are both on strike with the northeast-trending Jemez Fault Zone, suggesting these features developed preferentially along pre-existing rift structures. The subsurface structure and lithologic units of the Valles Caldera are shown in Figure 5. It should also be noted that early post-caldera lavas, tuffs, and interbedded lacustrine and debris flow deposits show steep dips and variable thicknesses in adjacent fault blocks, suggesting that resurgence occurred relatively early in the caldera history. Figure 5. West-east cross section through the Valles Caldera. The section transects the Valles and Toledo ring fracture zones, the Redondo Creek Graben, and the Sulphur Springs hydrothermal system at core hole VC-2B. "No natural hydrothermal system exists at the Fenton Hill HDR test site. The reservoir at Fenton Hill is engineered, which allows the operator to control the reservoir temperature and volume by selecting the depth and intensity of pressure stimulation induced from the injection well. Experimental adjustments to these parameters over the course of the project are described in the Well Field Description section of this page (above)." cannot be used as a page name in this wiki. No natural hydrothermal system exists at the Fenton Hill HDR test site. The reservoir at Fenton Hill is engineered, which allows the operator to control the reservoir temperature and volume by selecting the depth and intensity of pressure stimulation induced from the injection well. Experimental adjustments to these parameters over the course of the project are described in the Well Field Description section of this page (above). "The heat source of the Valles Caldera Geothermal System is thought to be a silicic-magma chamber whose explosive eruption and subsequent collapse formed the Valles and Toledo Calderas. Teleseismic surveys have detected a low velocity zone between 5 and 15.5 km that underlies the active hydrothermal features on the western side of the caldera.'"`UNIQ--ref-000000CE-QINU`"' This region is conservatively estimated to contain at least 10% melt that is thought to represent a new pulse of magma into the crust, and may contribute to the heat flux of the caldera system." cannot be used as a page name in this wiki. The heat source of the Valles Caldera Geothermal System is thought to be a silicic-magma chamber whose explosive eruption and subsequent collapse formed the Valles and Toledo Calderas. Teleseismic surveys have detected a low velocity zone between 5 and 15.5 km that underlies the active hydrothermal features on the western side of the caldera. This region is conservatively estimated to contain at least 10% melt that is thought to represent a new pulse of magma into the crust, and may contribute to the heat flux of the caldera system. Geothermal fluids and gases were sampled at regular intervals during flow testing and heat-extraction experiments conducted on the shallow Phase I reservoirs. Water produced during flow testing of the shallow Phase I reservoirs was of good quality, with a total dissolved solids content of around 3000 ppm and a pH of 6.5 +/- 0.5. These properties are largely dependent on the degree of mixing between the injected water and fluids native to the reservoir rocks and on the concentration and displacement rate of these in-situ pore-fluids. The chemical properties of the produced waters are favorable for geothermal power production as they cause minimal problems with corrosion or deposition of scale minerals on piping, heat exchangers, and pumps at the land surface. Samples collected during heat extraction experiments of the Phase I reservoir were taken at the production wellhead, the injection wellhead, and the make-up pump that supplied water from storage ponds to replace the water lost downhole by permeation into the reservoir walls. Samples were analyzed to identify compositional changes in the produced fluid in order to study the reservoir behavior under normal (recirculating) operating conditions. Concentrations of certain dissolved species appear to be derived from the displacement of an indigenous pore-fluid while others appear to be derived from dissolution of minerals present in the reservoir rock. Water sampled from the production well was relatively low in total dissolved solids, confirming that produced fluids would have minimal tendency for corrosion or scaling. The authors attempt to relate the changes in the liquid and gas chemistry of the geothermal fluids to geochemical processes that resulted from the heat-extraction and flow testing experiments. Specifically, the application of the silica and Na-K-Ca geothermometers and the implications of the pore-fluid displacement theory are examined to evaluate the long-term effects of fluid geochemistry on heat extraction from HDR reservoirs. Radioisotopic Tracer testing techniques were used to quantitatively characterize flow at injection and production points in the hydraulically fractured Phase I reservoir and to map fracture intersections within the EE-1 and GT-2B wellbores. 131I and 82Br radioisotope tracers were successfully used in conjunction with downhole gamma logging at temperatures up to 200°C and depths to 3 km. Residence Time Distribution (RTD) techniques using 82Br and sodium fluorescein tracers were also developed to investigate individual flow path characteristics and to estimate overall fracture volumes and levels of dispersed mixing. The levels of mixing observed were much higher than would be expected for purely hydrodynamic dispersion in nearly potential or steady laminar flow in flat fractures between the injection and production wellbores. Variable residence times of the different radioisotopes were caused by the complex distribution of crack apertures within the reservoir, and suggest that these reservoir features may control the overall RTD in the convectively dominated system. The results of the tracer testing study prompted the development of a methodology for analyzing the internal flow characteristics of a fractured geothermal reservoir using tracer-determined RTD curves. The methodology emphasizes the comparison of statistical quantities obtained from the tracer curves of different reservoirs or of the same reservoir under different conditions. In this way, empirical reservoir performance correlations may be constructed unambiguously using model-independent information. Fluid flow behavior may be characterized further using downhole measurements of the tracer response exiting from discrete fracture zones in the reservoir. In 1988, Goff et al. integrated stratigraphic, temperature gradient, hydrogeochemical, hydrologic, and geologic data from VC-1, select geothermal test wells (AET-4 and WC 23-4), and geophone emplacement holes (PC-1 and PC-2) of the Fenton Hill HDR and Redondo geothermal projects in order to construct a comprehensive hydrologic and temperature gradient model of the hydrothermal outflow plume issuing from the western margin of the Valles Caldera. Hydrochemical data from aquifers sampled in the VC-1 core hole confirmed the existence of the outflow plume. Combination of this data with previous datasets showed that the outflow at Valles is complex, and is fed by at least two major fluid reservoirs (the Redondo Creek and Sulphur Springs reservoirs). Discharge rates, thermal gradients, relative heat flow estimates, and mixing relationships suggest that 25-50% of the lateral flow occurs along vertical conduits associated with the Jemez Fault Zone, with subordinate flow occurring in horizontal, semipermeable Paleozoic strata overlying Precambrian crystalline basement rocks. Paleozoic strata are nonhomogeneous in their lithology and so function as poorly connected zones of lateral flow, such that there is no single unique thermal aquifer outside of the western margin of the caldera. In 2002, Goff and Janik reviewed geochemical results from approximately 80 gas analyses of samples obtained from fumaroles, springs, and wells over the previous two decades to better understand the geologic setting of gas features with respect to the caldera, to investigate variations in gas compositions that occurred during drilling and flow testing of the Valles scientific wells, and to compare Valles gases with those at other geothermal sites, including the Yellowstone and Long Valley Calderas. The study confirmed that Valles gases are chemically and isotopically similar to those in other volcanic-hosted geothermal systems, and that the gases are in apparent equilibrium at temperatures >200°C. Relative proportions of Ar, He, and N2 are similar to those measured at hot spot locations such as Yellowstone and Kilauea. He R/Ra values of 4-6 within the caldera are suggestive of mantle/magmatic degassing, whereas R/Ra values of < 0.7 at Fenton Hill (outside the caldera rim) reflect a He input dominated by U/Th decay in crustal rocks. Major gas components of the caldera surface discharges have remained relatively constant over the course of the sampling program and generally resemble gas compositions of the geothermal wells, excluding the Footbath acid spring, whose gas composition changed noticeably during 6 years of drilling and flow testing of wells VC-2A and VC-2B. The study also revealed that Valles Caldera gases contained relatively little CH4 and N2 compared to other geothermal systems hosted within sedimentary rocks, suggesting that organic carbon and nitrogen in Paleozoic and Miocene strata were depleted during 13 million years of magmatism in the Jemez Volcanic Field. ↑ 1.0 1.1 1.2 1.3 1.4 1.5 Zora V. Dash,Donald S. Dreesen,F. Walter,Leigh S. House. 1985. Massive Hydraulic Fracture of Fenton Hill HDR Well EE-3. Los Alamos, NM: Los Alamos National Laboratory, NM. Report No. : LA-UR-85-931. ↑ 3.0 3.1 3.2 3.3 3.4 Fraser E. Goff,Cathy J. Janik. 2002. Gas Geochemistry Of The Valles Caldera Region, New Mexico And Comparisons With Gases At Yellowstone, Long Valley And Other Geothermal Systems. Journal of Volcanology and Geothermal Research. 116(3-4):299-323. ↑ 4.0 4.1 4.2 4.3 4.4 R L Smith,R A Bailey. 1968. Resurgent cauldrons. Geological Society of America Memoir 116. 613-662. ↑ Fraser E. Goff,Jamie N. Gardner. 1994. 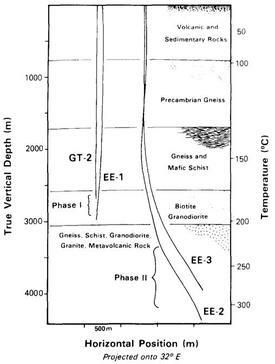 Evolution of a Mineralized Geothermal System, Valles Caldera, New Mexico. Economic Geology. 89(8):1803-1832. ↑ 6.0 6.1 Clyde Kelly,E.V. Anspach. 1913. A Preliminary Study of the Waters of the Jemez Plateau, New Mexico. University of New Mexico Bulletin, Chemistry Series. 1(1):43. ↑ 7.0 7.1 7.2 Richard R. Doell,G. Brent Dalrymple,Robert Leland Smith,Roy A. Bailey. 1968. Paleomagnetism, Potassium-Argon Ages, and Geology of Rhyolites and Associated Rocks of the Valles Caldera, New Mexico. Geological Society of America Memoirs. 116:211-248. ↑ 8.0 8.1 Robert Leland Smith,Roy A. Bailey,Clarence Samuel Ross. Geologic Map of the Jemez Mountains, New Mexico. [Map]. Place of publication not provided. U.S. Geological Survey. 1970. Scale 1:250,000. Available from: http://pubs.er.usgs.gov/publication/i571. ↑ 9.0 9.1 9.2 9.3 9.4 Roy A. Bailey,Robert Leland Smith,Clarence Samuel Ross. 1969. Stratigraphic Nomenclature of Volcanic Rocks in the Jemez Mountains, New Mexico. Washington D.C.: U.S. Geological Survey. 19p. ↑ 10.0 10.1 10.2 A. W. Laughlin,A. C. Eddy,R. Laney,M. J. Aldrich Jr.. 1983. Geology Of The Fenton Hill, New Mexico, Hot Dry Rock Site. Journal of Volcanology and Geothermal Research. 15(1-3):21-41. ↑ 11.0 11.1 Fraser E. Goff,Charles O. Grigsby. 1982. Valles Caldera Geothermal Systems, New Mexico, U.S.A.. Journal of Hydrology. 56(1-2):119-136. ↑ 12.0 12.1 12.2 Jamie N. Gardner,Fraser E. Goff,Sammy Garcia,Roland C. Hagan. 1986. Stratigraphic Relations and Lithologic Variations in the Jemez Volcanic Field, New Mexico. Journal of Geophysical Research. 91(B2):1763-1778. ↑ 13.0 13.1 13.2 13.3 Jamie N. Gardner. 2010. Rhyolites and Associated Deposits of the Valles-Toledo Caldera Complex. New Mexico Geology. 32(1):3-18. ↑ 14.0 14.1 14.2 14.3 Fraser E. Goff,Jamie N. Gardner,Steven L. Reneau,Shari A. Kelley,Kirt A. Kempter,John R. Lawrence. Geologic Map of the Valles Caldera. [Map]. Place of publication not provided. New Mexico Bureau of Geology and Mineral Resources. 2011. Scale 1:50,000. Available from: http://geoinfo.nmt.edu/publications/maps/geologic/gm/79/. ↑ 15.0 15.1 15.2 Steven L. Reneau,Jamie N. Gardner,Steven L. Forman. 1996. New Evidence for the Age of the Youngest Eruptions in the Valles Caldera, New Mexico. Geology. 24(1):7-10. ↑ Terry L. Spell,Philip R. Kyle. 1989. Petrogenesis of Valle Grande Member Rhyolites, Valles Caldera, New Mexico- Implications for Evolution of the Jemez Mountains Magmatic System. Journal of Geophysical Research. 94(B8):10379-10396. ↑ Giday WoldeGabriel,Fraser E. Goff. 1989. Temporal Relations of Volcanism and Hydrothermal Systems in Two Areas of the Jemez Volcanic Field, New Mexico. New Mexico Geology. 17(11):986-989. ↑ Giday WoldeGabriel,Fraser E. Goff. 1992. K-Ar Dates Of Hydrothermal Clays From Core Hole VC-2B, Valles Caldera, New Mexico And Their Relation To Alteration In A Large Hydrothermal System. Journal of Volcanology and Geothermal Research. 50(3):207-230. ↑ T. Mark Harrison,Paul Morgan,David D. Blackwell. 1986. Constraints on the Age of Heating at the Fenton Hill Site, Valles Caldera, New Mexico. Journal of Geophysical Research. 91(B2):1899-1908. ↑ Terry L. Spell,T. Mark Harrison,John A. Wolff. 1990. 40Ar/39Ar Dating of the Bandelier Tuff and San Diego Canyon Ignimbrites, Jemez Mountains, New Mexico- Temporal Constraints on Magmatic Evolution. Journal of Volcanology and Geothermal Research. 43(1-4):175-193. ↑ Stephen Self,John A. Wolff,Terry L. Spell,C.E. Skuba,M.M. Morrissey. 1991. Revisions to the Stratigraphy and Volcanology of the Post-0.5 Ma Units and the Volcanic Section of VC-1 Core Hole, Valles Caldera, New Mexico. Journal of Geophysical Research. 96(B3):4107-4116. ↑ 22.0 22.1 22.2 Terry L. Spell,T. Mark Harrison. 1993. 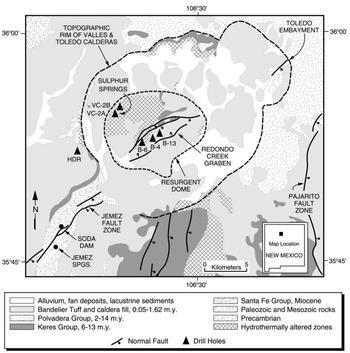 40Ar/39Ar Geochronology of Post-Valles Caldera Rhyolites, Jemez Volcanic Field, New Mexico. Journal of Geophysical Research. 98(B5):8031-8051. ↑ 23.0 23.1 23.2 Glen A. Izett,John D. Obradovich. 1994. Ar-40/Ar-39 Age Constraints for the Jaramillo Normal Subchron and the Matuyama-Brunhes Geomagnetic Boundary. Journal of Geophysical Research. 99(B2):2925-2934. ↑ 24.0 24.1 24.2 24.3 24.4 24.5 24.6 24.7 Erin H. Phillips. 2004. Collapse and Resurgence of the Valles Caldera, Jemez Mtns, NM- 40Ar/39Ar Ages of Megabreccia Blocks and Age Constraints on Timing and Duration of Resurgence [Thesis]. [Socorro, N.M.]: New Mexico Institute of Mining and Technology. ↑ D. G. Brookins,A. W. Laughlin. 1983. Rb-Sr Geochronologic Investigation Of Precambrian Samples From Deep Geothermal Drill Holes, Fenton Hill, New Mexico. Journal of Volcanology and Geothermal Research. 15(1-3):43-58. ↑ R.F. Marvin,S.W. Dobson. 1979. Radiometric Ages- Compilation 'B', U.S. Geological Survey. Socorro, NM: New Mexico Bureau of Mines and Mineral Resources. Report No. : Isochron/West no. 26. ↑ Fraser E. Goff,Lisa Shevenell. 1987. Travertine Deposits of Soda Dam, New Mexico, and Their Implications for the Age and Evolution of the Valles Caldera Hydrothermal System. Geological Society of America Bulletin. 99(2):292-302. ↑ Stephen Self,D.E. Kircher,John A. Wolff. 1988. The El Cajete Series, Valles Caldera, New Mexico. Journal of Geophysical Research. 93(B6):6113-6127. ↑ Hisatoshi Ito,Kazuhiro Tanaka. 1995. Insights On The Thermal History Of The Valles Caldera, New Mexico- Evidence From Zircon Fission-Track Analysis. Journal of volcanology and geothermal research. 67(1):153-160. ↑ K. Ogoh,Shin Toyoda,Sumiko Ikeda,Motoji Ikeya,Fraser E. Goff. 1993. Cooling History of the Valles Caldera, New Mexico Using ESR Dating Method. Applied Radiation and Isotopes. 44(1-2):233-237. ↑ 31.0 31.1 31.2 Shin Toyoda,Fraser Goff,Sumiko Ikeda,Motoji Ikeya. 1995. ESR Dating of Quartz Phenocrysts in the El Cajete and Battleship Rock Members of Valles Rhyolite, Valles Caldera, New Mexico. Journal of Volcanology and Geothermal Research. 67(1):29-40. ↑ 33.0 33.1 33.2 33.3 33.4 33.5 33.6 33.7 Fraser E. Goff,Jamie N. Gardner,Steven L. Reneau,Cathy J. Goff. Preliminary Geologic Map of the Redondo Peak Quadrangle, Sandoval County, New Mexico. [Map]. Place of publication not provided. New Mexico Bureau of Geology and Mineral Resources. 2006. Scale 1:24,000. Available from: http://geoinfo.nmt.edu/publications/maps/geologic/ofgm/downloads/111/Redondo%20Peak%20Report.pdf. ↑ 34.0 34.1 Donald W Brown,Robert DuTeaux,Paul Kruger,Daniel Swenson,Tsutomu Yamaguchi. 1999. Fluid Circulation and Heat Extraction from Engineered Geothermal Reservoirs. Geothermics. 28(4-5):553-572. ↑ 35.0 35.1 35.2 35.3 Thomas Merlan,Kurt F. Anschuetz. 2007. History of the Baca Location No. 1. Fort Collins, CO: U.S. Department of Agriculture, Forest Service. 31-47p. ↑ 36.0 36.1 36.2 36.3 36.4 D. L. Nielson,J. B. Hulen. 1984. Internal Geology and Evolution of the Redondo Dome, Valles Caldera, New Mexico. Journal of Geophysical Research. 89:8695-8711. ↑ 37.0 37.1 37.2 37.3 Fraser E. Goff,Lisa Shevenell,Jamie N. Gardner,Francois D. Vuataz,Charles O. Grigsby. 1988. The Hydrothermal Outflow Plume of Valles Caldera, New Mexico, and a Comparison with Other Outflow Plumes. Journal of Geophysical Research. 93(B6):6041-6058. ↑ F.M. Phillips,Fraser E. Goff,Francois D. Vuataz,H.W. Bentley,H.E. Gove. 1984. 36Cl as a tracer in geothermal systems- Example from Valles Caldera, New Mexico. Geophysical Research Letters. 11(12):1227-1230. ↑ 39.0 39.1 39.2 39.3 39.4 Marshall Reiter,Charles Weidman,C.L. Edwards,Harold Hartman. 1976. Subsurface Temperature Data in Jemez Mountains, New Mexico. Socorro, NM: New Mexico Bureau of Mines and Mineral Resources. Report No. : Circular 151. ↑ 40.0 40.1 40.2 40.3 40.4 40.5 Zora V. Dash,Hugh D. Murphy. 1981. Summary of Hot-Dry-Rock Geothermal Reservoir Testing 1978-1980. Los Alamos, NM: Los Alamos National Laboratory, NM. Report No. : LA-9080-SR.
↑ 41.0 41.1 41.2 41.3 Zora V. Dash,Hugh D. Murphy,R. L. Aamodt,R. G. Aguilar,Donald W. Brown,Dale A. Counce,H. N. Fisher,Charles O. Grigsby,H. Keppler,A. W. Laughlin,R. M. Potter,Jefferson W. Tester,Pat E. Trujillo Jr,G. Zyvoloski. 1983. Hot Dry Rock Geothermal Reservoir Testing- 1978 to 1980. Journal of Volcanology and Geothermal Research. 15(1-3):59-99. ↑ 42.00 42.01 42.02 42.03 42.04 42.05 42.06 42.07 42.08 42.09 42.10 42.11 42.12 42.13 John T. Whetten,Bert R. Dennis,Donald S. Dreesen,Leigh S. House,Hugh D. Murphy,Bruce A. Robinson,Morton C. Smith. 1987. The US Hot Dry Rock Project. Geothermics. 16(4):331-339. ↑ 44.0 44.1 44.2 44.3 Michael C. Fehler,Leigh S. House,Hideshi Kaieda. 1987. Determining Planes Along Which Earthquakes Occur- Method of Application to Earthquakes Accompanying Hydraulic Fracturing. Journal of Geophysical Research. 92(B9):9407-9414. ↑ 45.0 45.1 45.2 Lisa Shevenell,Fraser E. Goff,Dan Miles,Al Waibel,Chandler Swanberg. 1988. Lithologic Descriptions and Temperature Profiles of Five Wells in the Southwestern Valles Caldera Region, New Mexico. Los Alamos, NM: Los Alamos National Laboratory, NM. Report No. : LA-11165-OBES. ↑ William D. Purtymun,Francis G. West,R. A. Pettitt. 1974. Geology of Geothermal Test Hole GT-2 Fenton Hill Site, July 1974. Los Alamos, NM: Los Alamos National Laboratory, NM. Report No. : LA-5780-MS.
↑ 50.0 50.1 50.2 50.3 50.4 Zora V. Dash. 1989. ICFT- An Initial Closed-Loop Flow Test of the Fenton Hill Phase II HDR Reservoir. Los Alamos, NM: Los Alamos National Laboratory, NM. Report No. : LA-9080-SR.
↑ 51.0 51.1 51.2 51.3 51.4 51.5 51.6 Charles O. Grigsby,Jefferson W. Tester,Pat E. Trujillo Jr,Dale A. Counce. 1989. Rock-Water Interactions in the Fenton Hill, New Mexico, Hot Dry Rock Geothermal Systems I. Fluid Mixing and Chemical Geothermometry. Geothermics. 18(5):629-656. ↑ 52.0 52.1 52.2 Charles O. Grigsby,Jefferson W. Tester,P. E. Trujillo,Dale A. Counce,J. Abbott,C. E. Holley,L. A. Blatz. 1983. Rock-Water Interactions In Hot Dry Rock Geothermal Systems- Field Investigations Of In Situ Geochemical Behavior. Journal of Volcanology and Geothermal Research. 15(1-3):101-136. ↑ 53.0 53.1 Hugh Murphy,Donald W Brown,Reinhard Jung,Isao Matsunaga,Roger Parker. 1999. Hydraulics and Well Testing of Engineered Geothermal Reservoirs. Geothermics. 28(4-5):491-506. ↑ H. Murphy,R. Drake,J. Tester,G. Zyvoloski. 1985. Economics of a Conceptual 75 MW Hot Dry Rock Geothermal Electric Power-Station. Geothermics. 14(2):459-474. ↑ Hugh D. Murphy. 1987. Hot Dry Rock Reservoir Engineering. (!) : Los Alamos National Laboratory, NM. Report No. : LA-UR-87-3388. ↑ Chandler A. Swanberg. 1983. Geothermal Resources of Rifts- a Comparison of the Rio Grande Rift and the Salton Trough. Tectonophysics. 94(1-4):659-678. ↑ Francois D. Vuataz,Fraser E. Goff. 1986. Isotope Geochemistry of Thermal and Nonthermal Waters in the Valles Caldera, Jemez Mountains, Northern New Mexico. Journal of Geophysical Research. 91(B2):1835-1853. ↑ Usha Rao, U. Fehn, R. T. D. Teng, Fraser E. Goff. 1996. Sources Of Chloride In Hydrothermal Fluids From The Valles Caldera, New Mexico- A 36Cl Study. Journal of Volcanology and Geothermal Research. 72(1):59-70. ↑ 66.0 66.1 66.2 R L Smith,R A Bailey. 1966. The Bandelier Tuff- A Study of Ash-Flow Eruption Cycles from Zoned Magma Chambers. Bulletin Volcanologique. 29(1):83-103. ↑ W.S. Baldridge,P.E. Damon,M. Shafiqullah,R.J. Bridwell. 1980. Evolution of the Central Rio Grande Rift, New Mexico- New Potassium-Argon Ages. Earth and Planetary Science Letters. 51(2):309-321. ↑ G.R. Keller,Paul Morgan,William R. Seager. 1990. Crustal Structure, Gravity Anomalies and Heat Flow in the Southern Rio Grande Rift and Their Relationship to Extensional Tectonics. Tectonophysics. 174(1-2):21-37. ↑ William R. Seager,M. Shafiqullah,J.W. Hawley,R.F. Marvin. 1984. New K-Ar Dates from Basalts and the Evolution of the Southern Rio Grande Rift. Geological Society of America Bulletin. 95(1):87-99. ↑ 71.0 71.1 K.H. Olsen,W.S. Baldridge,J.F. Callender. 1987. Rio Grande Rift- an Overview. Tectonophysics. 143(1-3):119-139. ↑ L.L. Corbitt,Lee A. Woodward. 1973. Tectonic Framework of Cordilleran Fold Belt in Southwestern New Mexico. American Association of Petroleum Geology Bulletin. 57(11):2207-2216. ↑ M.J. Jr. Aldrich. 1986. Tectonics of the Jemez Lineament in the Jemez Mountains and Rio Grande Rift. Journal of Geophysical Research. 91(B2):1753-1762. ↑ Fraser E. Goff,J. N. Gardner. Geologic map of the Sulphur Springs Area, Valles Caldera Geothermal System, New Mexico. [Map]. Place of publication not provided. Los Alamos National Laboratory, NM. 1980. Scale 1:5000. Available from: http://www.osti.gov/bridge/product.biblio.jsp?osti_id=6883334. ↑ Grant Heiken,Fraser E. Goff. 1983. Hot Dry Rock Geothermal Energy in the Jemez Volcanic Field, New Mexico. Journal of Volcanology and Geothermal Research. 15(1-3):223-246. ↑ Steve J. Chipera,Fraser E. Goff,Cathy J. Goff,Melissa Fittipaldo. 2008. Zeolitization Of Intracaldera Sediments And Rhyolitic Rocks In The 1.25 Ma Lake Of Valles Caldera, New Mexico, USA. Journal of Volcanology and Geothermal Research. 178(2):317-330. ↑ Lee K. Steck,Clifford H. Thurber,Michael C. Fehler,William J. Lutter,Peter M. Roberts,W. Scott Baldridge,Darrik G. Stafford,Robert Sessions. 1998. Crust and Upper Mantle P Wave Velocity Structure Beneath Valles Caldera, New Mexico- Results from the Jemez Teleseismic Tomography Experiment. Journal of Geophysical Research. 103(B10):24301-24320. ↑ Jefferson W. Tester,R. L. Bivins,R. M. Potter. 1982. Interwell Tracer Analyses of a Hydraulically Fractured Granitic Geothermal Reservoir. Society of Petroleum Engineers. 22:537-554. ↑ Bruce A. Robinson,Jefferson W. Tester. 1984. Dispersed Fluid Flow in Fractured Reservoirs- an Analysis of Tracer-Determined Residence Time Distributions. Journal of Geophysical Research. 89(B12):10374-10384. This page was last modified on 27 October 2015, at 17:49.